If you are into road cycling and haven’t been to Gettysburg, Pennsylvania to ride – here is your invitation. The area offers not only incredible historical experiences and exciting culinary and craft beverage scenes, it also boasts some fantastic road cycling opportunities. Aside from the very bikeable Gettysburg National Military Park, there are endless country roads surrounding the town of Gettysburg that provide stunning scenery and fun cycling. While the route possibilities are seemingly endless, here are three routes to get you inspired for your Gettysburg road cycling adventure. Each route below includes a map, cue sheet, description of the route and photos of scenery along the way. You will get a little bit of everything on this approximately 13-mile route, which is courtesy of Healthy Adams Bicycle Pedestrian, Inc. This route begins at the historic Federal Pointe Inn. Constructed in 1896, the building served as Gettysburg’s first high school, then called the Meade School, and now exists as a 23-suite boutique hotel. The route heads south on W Confederate Avenue – a battlefield road where you’ll enjoy vast battlefield scenery and pass numerous monuments and markers, before turning onto Millerstown Road. Cautiously keep your eye out to your left on Millerstown, as you’ll be passing Eisenhower National Historic Site. The route heads south onto Red Rock Road, where you’ll come upon the John Eisenhower Bridge – named after President Eisenhower’s son. You’ll cross the pedestrian and cyclist only bridge and take a trail that will bring you out to another historic bridge – Sachs Covered Bridge. Be sure to take in the scenery of one of the few remaining covered bridges in Adams County before continuing south on Pumping Station Road. Next, you’ll take several quiet back roads that provide peaceful farm scenery, and then will end up on Route 30 which will take you right back to the Federal Pointe Inn. If you are into road cycling and find yourself in Adams County, you must venture north of Gettysburg into the Adams County countryside. Country roads, scenic farmland, bountiful orchards and even fruit markets await you in upper Adams County. While there are so many possibilities and roads to explore, here is a route to get you started. This approximately 32-mile route starts just north of the town of Gettysburg, at the Eternal Light Peace Memorial at Gettysburg National Military Park. It takes you north on Mummasburg Road, into Arendtsville, one of the many small towns that make up Adams County. From Arendtsville, you take a small, farm-lined connector road into Biglerville – another small town. You will wind around some back roads, and then find yourself briefly on PA 34 North, heading into one more smaller town – Bendersville. You’ll travel through Bendersville and pass some beautiful orchard scenery, and then onto Nawakwa and Narrows Roads, which wind peacefully through farmland, wooded areas and along a stream. Both are part of the Scenic Valley Tour. Keep your eye out for the South Mountain Fairgrounds on Narrows Road – the site of Adams County’s annual National Apple Harvest Festival. You’ll soon find yourself back in Arendtsville, but not before passing McDannell’s Fruit Farm and Market. Stop and grab a fresh apple to fuel the rest of your ride. From Arendtsville, you’ll take Mummasburg Road again, back into Gettysburg and to the Peace Light Memorial. A note on this route – when you’re about halfway through the ride – at the intersection of Guernsey Road and PA 34 N, you will be about one-tenth of a mile north of Hollabaugh Bros. Fruit Farm and Market. If you’re looking for a break and a treat, turn left onto PA 34 and visit the market. Northern Adams County Route cue sheet and map. Whether you’re an experienced cycler, or just beginning, the Gettysburg battlefield is one of those places that you must experience on your bicycle. While the battlefield roads are shared with cars, cyclists, pedestrians, and even the occasional horse crossing, the speed limit is low and many roads are one way, making it a pleasant and stress-free road ride for a cyclist. This approximately 13.5-mile route covers most of the battlefield, but there are plenty of opportunities to lengthen the route and veer off and explore some of the smaller battlefield roads along the way. You will pass countless monuments and markers, so be sure to pick a few to hop off and see up close. The route starts at the historic Seminary campus and heads south, along the western edge of the battlefield. It rounds the southern edge of the battlefield, and then starts to head north, passing Big Round Top and Little Round Top (a great place to dismount and check out the view). You’ll keep heading north, passing the largest monument on the battlefield, the Pennsylvania Monument. If your legs have it in them, climb to the top to take in the incredible view. You’ll head east on Granite Schoolhouse Road, a back wooded road that will connect you to the eastern end of the battlefield. You will head north on E Confederate Avenue and then pass through a bit of town. You’ll now be exploring the northern tip of the battlefield, where fighting occurred on Day 1 during the Battle of Gettysburg. You’ll pass the Eternal Light Peace Memorial, cruise along Buford Avenue, take in the sites of the McPherson Barn, and then connect with Route 30 which will take you right back to the Seminary campus. A note about this route – cyclists do not have to abide by one-way roads on the Gettysburg battlefield. Battlefield Route cue sheet and map. 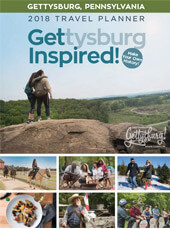 Road cyclers – add Gettysburg to your riding bucket list! If you want to ride in the area but don’t have your own bike, you can rent one by the hour or day at Gettysbike. For more resources, information, route ideas, bicycling news, and downloadable cue sheets, check out Healthy Adams Bicycle Pedestrian, Inc. For more information on riding at Gettysburg National Military Park, click here. Riding in a new destination can be overwhelming, but we’re here to help – leave your Adams County road cycling questions in the comments!